This page needs to be split into subpages. Is this a compilation, or a full guide? 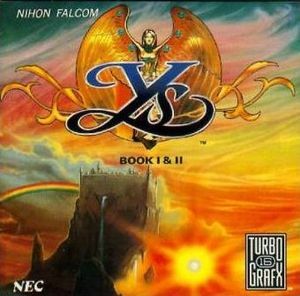 Released for PC Engine by Nihon Falcom and Hudson Soft in 1989, It was released as Ys Book I & II for the TurboGrafx-CD in North America in 1990, and was a pack-in title for the TurboDuo in 1992. Ys I & II was released on the Virtual Console in Japan on October 16, 2007, in North America on August 25, 2008, and in Europe and Australia on September 5, 2008. Ys Book I & II cover art. Ys I & II consists of early enhanced remakes of the first two games released in the Ys series, Ys: Ancient Ys Vanished and Ys II: Ancient Ys Vanished – The Final Chapter. It was one of the first video games to use CD-ROM, which was utilized to provide enhanced graphics, animated cut scenes, a Red Book CD audio soundtrack, and voice acting. The game's English localization was also one of the first to use voice dubbing. In both games the player controls a red-haired swordsman named Adol Christin. In the first game he must seek out the six Books of Ys. These books contain the history of the ancient, vanished land of Ys, and will give him the knowledge he needs to defeat the evil forces currently sweeping the land of Esteria. In Ys II Adol is transported to the floating civilization of Ys, and begins a quest to unravel the secrets of the land, and finally rid it and Esteria of evil. All English translations of Ys II were part of a compilation; no standalone version has been localized. 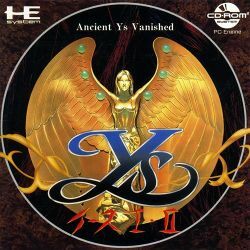 Ys I & II Complete was released in Japan for Windows on June 28, 2001. It contains updated graphics and FMV sequences. Ys I & II: Eternal Story was released on PlayStation 2 on October 7, 2003. Based on Ys I & II Complete, it also added new characters and items alongside the previous game's improvements. Eternal Story was also a Japan-only release. Legacy of Ys: Books I & II was released on Nintendo DS in the United States on February 24, 2009. The remake includes 3D graphics, updated sound, and multiplayer for up to four people. Each copy of the first printing of the game also includes a bonus soundtrack CD. Ys I & II Chronicles was released for the PSP on July 16, 2009. It is also based on Ys I & II Complete. XSEED Games localized and published the game in North America, where it was released on February 22, 2011. It was also released in Europe (only on PlayStation Network) on February 23, 2011. When starting a new game, the player can choose between two different game modes, which will display character portraits from the 2001 Windows release, or entirely new portraits created for this release. Ys I & II Chronicles was released in Japan for Windows on December 24, 2009. It is also based on Ys I & II Complete. Ys I & II Chronicles+ is a Steam-based PC edition of Ys I & II Chronicles that combines the PSP version with the PC release Ys I & II Complete. This page was last edited on 30 May 2016, at 14:51.